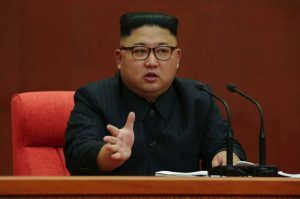 Kim Jong Un speaks during the second plenary meeting of the 7th WPK Central Committee at a conference hall in the central party complex in Pyongyang on October 7, 2017 (Photo: Rodong Sinmun). The second plenary meeting of the 7th Central Committee of the Workers’ Party of Korea [WPK] was held on October 7 (Saturday). The last plenary meeting of the 7th Central Committee of the WPK was held on the sidelines of the 7th Party Congress in May 2016. Kim Jong Un (Kim Cho’ng-u’n) presided over the meeting and was joined on the platform by members of the WPK Political Bureau Presidium (standing committee) Supreme People’s Assembly Presidium President Kim Yong Nam [Kim Yo’ng-nam], Korean People’s Army [KPA] General Political Department Director and State Affairs Commission Vice Chairman VMar Hwang Pyong So [Hwang Pyo’ng-so], DPRK Premier and State Affairs Commission Vice Chairman Pak Pong Ju [Pak Pong-chu] and WPK Vice Chairman for Workers and Social Organizations and State Affairs Commission Vice Chairman Choe Ryong Hae [Ch’oe Ryo’ng-hae]. Also attending the meeting were members and alternate (candidate) members of the WPK’s 7th Central Committee, along with members of the Party Central Auditing Commission. Attending the meeting with observer status were functionaries and cadres of the DPRK Cabinet’s ministries, commissions and institutions, WPK Central Committee cadres, managers of industrial sites and other production units and officials of local party and state organizations. Overview of the venue of the second plenary meeting of the 7th WPK Central Committee on October 7, 2017 (Photo: Rodong Sinmun/KCNA). 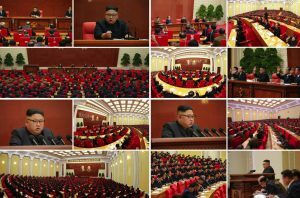 Views of Kim Jong Un, platform members and participants at the 2nd meeting of th 7th WPK Central Committee on October 7, 2017 (Photo: Rodong Sinmun). In his report he made an analysis of the complicated international situation prevailing around the DPRK and the important matters arising therefrom and mentioned the orientation of our Party’s immediate activities and economic development to cope with the prevailing situation and set forth the strategic tasks and ways for its materialization. He referred to the fact that the US imperialists are making last-ditch efforts to completely stifle the sovereignty and the rights to existence and development of the DPRK by cooking up UNSC “sanctions resolutions” one after another with mobilization of their vassal forces. He solemnly declared: The nuclear weapons of the DPRK are a precious fruition borne by its people’s bloody struggle for defending the destiny and sovereignty of the country from the protracted nuclear threats of the US imperialists. And they are powerful deterrent firmly safeguarding the peace and security in the Korean peninsula and Northeast Asia and reliably guaranteeing the Korean nation’s sovereignty and rights to existence and development and a treasured sword of justice to remove the nuclear clouds of tyranny bringing a horrible disaster to mankind and make it possible for the people to lead an independent and happy life under the clear and blue sky. He noted with appreciation that the country’s science and technology have developed by leaps and bounds and the national economy has grown on their strength this year, despite the escalating sanctions of the US imperialists and their vassal forces. This year’s struggle for implementing the decision of the Seventh WPK Congress gave valuable experience that we can readily blaze our path as long as there are perfect independent economic structure of the country and its solid foundations no matter what sanctions the enemies may impose, he said. The Chairman affirmed that the prevailing situation and the reality shows that our Party was absolutely right when it dynamically advanced along the socialist road of Chuch’e, holding fast to the line of simultaneously pushing forward the economic construction and the building of nuclear force and that our Party should invariably keep to this road in the future, too. Clarifying the Party’s principled stand and revolutionary strategy to put an end to the US imperialists’ nuclear blackmail and threat and pave a broad avenue to the building of a socialist economic power by further enhancing the might of the self-supporting national economy, he stressed the need to further strengthen the power of the country under the unfurled banner of independence and self-reliance and thus decisively frustrate the reckless nuclear war provocation and sinister sanctions and pressure of the enemies. Stating that the WPK will victoriously conclude the standoff with the US, which has lasted century after century, and bring earlier the victory in the socialist cause by giving full play to its correct leadership ability, the Chairman set forth the orientation and tasks for bringing the revolutionary struggle to a new great upsurge. He emphasized the need to further cement the might of single-minded unity between the Party and the masses. The single-minded unity is the cornerstone for existence of our Party and State and the most powerful weapon of the Korean revolution, he said, adding that it is important to direct and submit all activities of the Party and the State to strengthening the single-minded unity of the revolutionary ranks and steadily make the revolutionary climate of devotedly serving the people prevail throughout the Party. He stressed the need to continue thoroughly implementing the Party’s line of simultaneously developing the two fronts so as to successfully accomplish the great historic cause of building the state nuclear force. He also called for effecting fresh upswing in the building of a socialist economic power with the great spirit of self-reliance and self-development as the dynamic force and by dint of science and technology. The main key to foiling the extremely vicious sanctions and pressure of the US imperialists and their vassal forces and turning misfortune into a blessing is just self-reliance and the sci-tech strength, he said, underscoring the need to strengthen the independence and Chuch’e character of the national economy in every way. Saying that unyielding efforts should be made to develop the country’s economy into an independent economy relying on its own efforts, technology and resources under the line of making the national economy Chuch’e-based and the slogan of self-reliance and thus the process of overcoming today’s difficulty should be made an opportunity to bring a decisive turn in building a self-supporting economic power, he mentioned detailed tasks facing the economic sections. Noting that science and technology are an engine steering the building of a powerful socialist country, he stressed the need for all sectors and units to thoroughly implement the Party’s economic policy by giving definite priority to science and technology and enlisting the energy and wisdom of their sci-tech forces and producers. He said that the Cabinet and all the economic guidance organs should conduct well operations and command to strictly implement the revolutionary responding strategy. He set it as an important way to enhance the militant function and role of the Party organizations at all levels in every way in order to realize the Party’s revolutionary line and strategy. The whole Party should pay efforts to strengthening the primary party committees and party cells and thus make all the basic party organizations move in a militant and viable manner at all times under the unified leadership of the Party Central Committee and wage a dynamic drive to carry out the Party’s line and policies, he said. The present situation is stern and we are faced with ordeals but our Party always remains confident and will firmly adhere to the independent line and open the ever-victorious road despite any upheaval as it enjoys absolute support and trust from the entire army and all the people, he stressed. Our cause is invincible as long as there are the solid self-supporting economic foundation laid by President Kim Il Sung (Kim Il-so’ng) and leader Kim Jong Il (Kim Cho’ng-il), a large contingent of scientists trained by our Party, the army and people armed with the revolutionary spirit of our Party and the tradition of self-reliance, he said, calling for dynamically struggling for the final victory of the revolution, more closely united around the Party Central Committee. 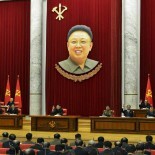 Following Jong Un’s remarks, the Central Committee approved a general policy line reflecting his report. Then, the Central Committee moved on to personnel matters. Members and alternates appointed to the WPK Political Bureau on October 7, 2017. Top row (L-R): Pak Kwang Ho; Pak Thae Song; Thae Jong Su. Bottom row (L-R): An Jong Su; Ri Yong Ho; Choe Hwi; Pak Thae Dok; Kim Yo Jong; Jong Kyong Thaek (Photos: Rodong Sinmun/KCNA). Appointed to the WPK Political Bureau as full members were Pak Kwang Ho [Pak Kwang-ho], Pak Thae Song [Pak T’ae-so’ng], Thae Jong Su [T’ae Cho’ng-su], An Jong Su [An Cho’ng-su] and Ri Yong Ho [Ri Yo’ng-ho]. Appointed to the WPK Political Bureau as candidate (alternate) members were Choe Hwi [Ch’oe Hwi], Pak Thae Dok [Pak T’ae-dok], Kim Yo Jong [Kim Yo’-cho’ng] and Jong Kyong Thaek [Cho’ng Kyo’ng-t’aek]. 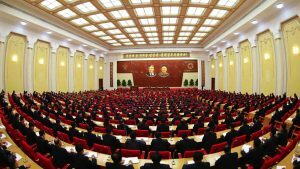 Between meetings of the Central Committee (like the one we’re talking about), the Political Bureau becomes the highest power organization of the WPK and makes political and policy decisions between gatherings of the Central Committee. A full member of the Political Bureau has a vote and can speak during Political Bureau meetings and a candidate (alternate) member has no vote but can speak and participate in debates. The vote of a Political Bureau member was best illustrated during the December 2013 meeting that expelled Jang Song Taek from the party and removed him from office. Appointed as WPK Vice Chairmen were Pak Kwang Ho [Pak Kwang-ho], Pak Thae Song [Pak T’ae-so’ng], Thae Jong Su [T’ae Cho’ng-su], Pak Thae Dok [Pak T’ae-dok], An Jong Su [An Cho’ng-su] and Choe Hwi [Ch’oe Hwi]. WPK Vice Chairmen have different portfolios and writs (i.e., Propaganda, Workers’ Organizations, International Affairs, Munitions Industry, etc.). WPK Vice Chairmen sometimes are also concurrently Central Committee Department Directors in their given policy area. After the 7th Party Congress, all WPK Vice Chairmen held concurrent Department Director positions. Based on current state media reporting, this no longer appears to be the case. 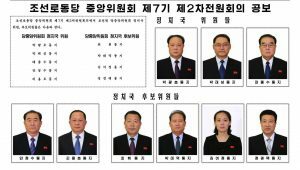 Appointed as members of the WPK Central Military Commission were Choe Ryong Hae [Ch’oe Ryo’ng-hae], Ri Pyong Chol [Ri Pyo’ng-ch’o’l], Jong Kyong Thaek [Cho’ng Kyo’ng-t’aek] and Jang Kil Song [Chang Kil-so’ng]. The WPK Central Military Commission exercises joint command and control over the DPRK’s conventional military forces and internal security agencies with the State Affairs Commission. It also deliberates, debates and approves military policies, defense acquisitions and munitions orders. Appointed as WPK Central Committee Department Directors were Choe Ryong Hae [Ch’oe Ryo’ng-hae], Pak Kwang Ho [Pak Kwang-ho], Thae Jong Su [T’ae Cho’ng-su], Kim Yong Su [Kim Yo’ng-su], Ryang Won Ho [Ryang Wo’n-ho], Ju Yong Sik [Chu Yo’ng-sik] and Sin Ryong Man [Sin Ryo’ng-man]. As mentioned above, department directors lead one of the 21 departments of the WPK Central Committee. As such they are responsible for the daily operational management, policy formulation and personnel affairs of a given department. Some Central Committee Departments link with DPRK Cabinet Ministries and Commissions or security organizations for policy specific matters (for example, the Propaganda and Agitation Department controls DPRK state media and arts and culture by linking with the Public Information Committee, Central Broadcasting Committee, Publication Guidance Bureau and the Ministry of Culture). Other Central Committee Departments have a service function (the WPK Organization Guidance Department controls the party organization and has ultimate approval powers over personnel appointments in the party, army and state; the Finance and Accounting Department manages money and construction projects; the General Affairs Department manages document delivery and logistics within the Central Committee apparatus). Appointed editor-in-chief of Rodong Sinmun was Kim Pyong Ho [Kim Pyo’ng-ho]. Rodong Sinmun is the daily organ (newspaper) of the WPK. Mr. Kim previously worked as a deputy director of the Propaganda and Agitation Department and was a leading official of the Korean Central News Agency. In the latter position he was responsible for the opening of the Associated Press [AP] bureau in Pyongyang. He has close ties to Kim Yo Jong. Appointed head of the WPK Inspection Commission was Jo Yon Jun [Cho Yo’n-chun]. Jo replaces Hong In Bom [Hong In-pom]. The Inspection Commission regulates membership and disciplinary matters in the party. If a WPK member is subject to suspension or expulsion from the party, his/her case automatically goes to the Inspection Commission for review. Jo Yon Jun appears to have been removed as an alternate member of the WPK Political Bureau which means that he is no longer the leading senior deputy director of the WPK Organization Guidance Department. In his previous position, Jo oversaw a number of investigations and dismissals of party members. Three new chairmen of WPK Provincial Committees were appointed. Kim Tu Il [Kim Tu-il] was appointed Chairman of the South P’yo’ngan WPK Provincial Committee. Ryang Jong Hun [Ryang Cho’ng-hun] was appointed Chairman of the North Hwanghae WPK Provincial Committee. Ri Hi Yong was appointed Chairman of the North Hamgyo’ng WPK Provincial Committee, replacing Jon Sung Hun [Cho’ng Su’ng-hun]. 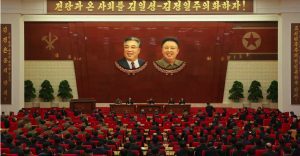 Elevated to full members of the WPK Central Committee from alternate (candidate) member status were: Kim Pyong Ho [Kim Pyo’ng-ho], Kim Myong Sik [Kim Myo’ng-sik], Kim Jong Sik [Kim Cho’ng-sik] and Choe Tu Yong [Ch’oe Tu-yo’ng]. Appointed as full members of the WPK Central Committee were: Ri Ju O [Ri Chu-o], Jon Kwang Ho [Cho’ng Kwang-ho], Ko In Ho [Ko In-ho], Choe Tong Myong [Ch’oe To’ng-myo’ng], Ryang Won Ho [Ryang Wo’n-ho], Kim Kwang Hyok [Kim Kwang-hyok], Hong Yong Chil [Hong Yo’ng-chil], Kim Myong Gil [Kim Myo’ng-kil], Kim Tu Il [Kim Tu-il], Ryang Jong Hun [Ryang Cho’ng-hun], Ri Hi Yong [Ri Hi-yo’ng] and Ho Chol Ryong [Ho Ch’o’l-ryo’ng]. Appointed as alternate members of the WPK Central Committee were: Sin Ryong Man [Sin Ryo’ng-man], Yu Jin [Yu Chin], Sin Yong Chol [Sin Yo’ng-ch’o’l], Jang Kil Song [Chang Kil-so’ng], Ju Song Nam [Chu So’ng-nam], Rim Kwang Ung [Rim Kwang-u’ng], Jang Ryong Sik [Chang Ryo’ng-sik], Kim Yong Ho [Kim Yo’ng-ho], Hyon Song Wol [Hyo’n So’ng-wo’l], Ma Won Chun [Ma Wo’n-ch’un], Ryom Chol Su [Ryom Ch’o’l-su], Song Chun Sop [So’ng Ch’un-sop], Jang Jun San [Chang Chun-sang], Kim Yong Jae [Kim Yo’ng-ch’ae], Kim Chun Do [Kim Ch’un-do], Kim Chang Gwang [Kim Chang-kwang], Kim Yong Gyu [Kim Yo’ng-kyu], Jo Jun Mo [Cho Ch’un-mo], Sin Yong Chol [Sin Yo’ng-ch’o’l], Kim Chang Yop [Kim Ch’ang-yop], Jang Chun Sil [Chang Ch’un-sil], Pak Chol Min [Pak Ch’o’l-min], Pak Mun Ho [Pak Mun-ho], Choe Sung Ryong [Ch’oe Su’ng-ryo’ng], Choe Rak Hyon [Ch’oe Rak-hyo’n], Ho Pong Il [Ho Pong-il], Kim Kwang Yong [Kim Kwang-yo’ng] and Son Thae Chol [Son T’ae-ch’o’l]. This article was written on 08 Oct 2017, and is filled under "self-development first" slogan, 2017 strategic rhetoric, 7th Party Congress, An Jong Su (WPK LID), basic party organizations, Cadre Affairs, Central Auditing Commission, Central Committee, Central Military Committee, Central Party Affairs/Cadres 5th Section, central party life, Choe Hwi (PAD], Choe Ryong Hae, Choe Tae Bok, Col. Gen. No Kwang Chol (KPAGS), Col. Gen. So Hong Chan, colonel general, Comprehensive Affairs, corps commanders, county/city party organizations, DPRK Cabinet, DPRK Central Court (Supreme Court), DPRK Diplomat Corps, DPRK External Relations, DPRK Premier, Events Management Section, Executive Policy Bureau, Finance and Accounting, Financial Planning Department, Five Year Economic Plan and Development Strategy (2016), Gen. Choe Pu Il, Gen. Kim Won Hong, Gen. Kim Yong Chol, Gen. Ri Myong Su, Gen. Ri Pyong Chol, Gen. Ri Yong Gil, Gen. Yun Jong Rin, General Affairs, General Federation of Trade Unions of Korea, gsd, Guard Command, Hong Sung Mu, Hong Yong Chil (KWP MBID), Hwang Pyong So, Hwang Pyong So (GPD; KPA VMAR), ideological slogans, Ideological Works, Im Chol Ung (DPRK Vice Premier WPK PB), Information Section, internal security, Jo Yon Jun (OGD), Joint Slogans, Jon Sung Hun (DPRK Vice Premier), Jon Sung Hun (DPRK Vice Premier/N. Hamgyo'ng WPK), Ju Yong Gil (GFTUK), KCNA, Kim Chang Gwang (SED), Kim Chang Yop (UAWK), Kim Family, Kim Il Sung Youth League, Kim Jong Sik, Kim Jong Sik (missile expert; Strategic Command; MBID), Kim Jong Un Visits, Kim Jong-il, Kim Jong-un, Kim Ki Nam, Kim Ki-nam, Kim Kwang Hyok (KPAF), Kim Kyong Ok (OGD), Kim Nung O (NPyongan WPK), Kim Pyong Ho (PAD), Kim Ung Chol (NDC), Kim Yo Jong, Kim Yong Hun (CC KWP Dept. Director), Kim Yong Nam, Kim Yong Su (WPK CC DD), kisyl, KJI Personal Secretariat, KJI/KJU Ideological Works, Ko In Ho, Korean Children's Union, Korean Democratic Women's Union, Korean People's Army Supreme Command, Korean People's Internal Security Forces, Korean People's Army (KPA), Korean Workers' Party (KWP), KPA basic party organizations, KPA branch party organizations, KPA General Logistics Department, KPA General Political Bureau, KPA General Political Department, KPA General Propaganda Department, KPA Organization Department, KPA Party Life, KPA supernumerary organizations, KPA Supreme Command, KWP Science and Education Department, Light Industry Department, Local Party Affairs, Lt. Gen. Ju Song Nam (815th Mechanized Division GPD), Lt. Gen. Kim Myong Nam (PDC), Lt. Gen. Kim Su Gil, Lt. Gen. Son Jong Nam, Ma Wo'n-ch'un (AD), Machine Building Industry Department, Membership Registration, military security command [msc], Ministry of Culture, Ministry of State Security, Ministry of the People's Armed Forces (MPAF), MPAF GPB, Navy Command, North Hamgyo'ng Province, North Hamgyo'ng Provincial People's Committee, North Hwanghae Provincial KWP Committee, North Korean press, Notification, Organization and Guidance Department, Pak Chun Hong (CC KWP), Pak Pong Ju, Pak Tae Dok (N. Hwanghae WPK), party cells, Party elders, party life, Party Life Guidance, Petitions and Appeals, Political Bureau, primary party committees, Propaganda and Agitation Department, Provincial Party Committees, Provincial Party System, Public Events, Pyongyang Defense Command, Ri Pyong Chol, Ri Yong Ho (FA), Second Economic Committee, Second Economy Commission, Sin Man Gyun (WPK LID), social control, South P'yo'ngan KWP Provincial Committee, State Affairs Commission, State Planning Commission (SPC), State Security Department, Supreme People's Assembly, Tae Jong Su, uawk, VADM Kim Myong Sik (KPAN), Workers' and Social Organizations, Yang Hyong Sop, Yu Jin.